Publisher: Allen & Unwin, 1999. My (US) edition: Poison Pen Press, 2008. 232 pages. Phryne has responded to a call for help from a pair of young university students, and plans to enjoy a bit of a holiday in Sydney at the same time. She's watching some cricket, storming the Arts Ball in a rather daring costume, locating her maid's sister, solving a crime or two, and of course enjoying the company of a lover. All that despite a climate that she finds melting. 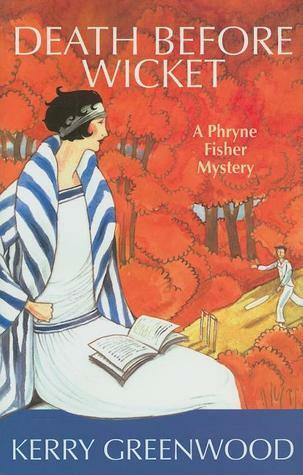 I always enjoy Phryne Fisher's outings, but found this one perhaps a bit less to my taste than most. Part of that might have been the cricket, a game which makes even less sense to me than baseball. That makes it hard (read: impossible) to follow whole paragraphs describing the game (even the title I'm pretty sure has more depth than my vague awareness of a play on some kind of cardinal cricket-sin called "leg before wicket"). Another source of my discontent might have been the setting. In Sydney, Phryne feels the frustration of being without her usual set of henchpersons and sidekicks. I missed them too. So, nothing wrong with the story, I just didn't have as much fun as usual (though at least this time she was seducing someone old enough to know what he was getting into, at least sort of. I do worry sometimes when she's dallying with inexperienced young men). Even on an off day (and this was more about tastes than anything wrong with the story) Phryne is good company. I recommend the book, and the whole series, to anyone who likes the between-the-wars setting, intriguing mysteries, a goodly touch of humor, and isn't put off by a female lead who likes to jump into bed at every opportunity (part of the fun, for me, is watching her rather straight-laced Catholic companion Dot deal with this). Full Disclosure: I checked Death Before Wicket out of my library, and received nothing from the writer or publisher in exchange for my honest review. The opinions expressed are my own and those of no one else. I am disclosing this in accordance with the Federal Trade Commission's 16 CFR, Part 255: "Guides Concerning the Use of Endorsements and Testimonials in Advertising."